Fort Worth Tours historian Dawson Granade shows a recent tour the view off the bluff looking north from downtown Fort Worth. 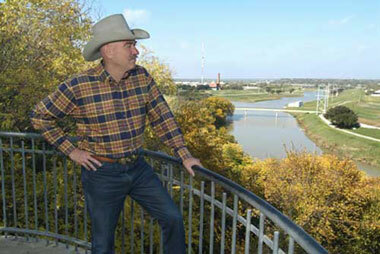 Dawson is standing near the spot Major Ripley Arnold stood as he gazed out over an area where the West and Clear Forks of the Trinity River merged. Major Arnold decided to build his fort here and Fort “Worth” had its beginning. For more information about stops on our tour, please visit our About Us page, Visited Locations page, our Historic Bios page, and our Photo Gallery. For pricing and available dates and times, please see our Tour Schedule Pricing page. Space goes quickly! Don’t miss this tour while you’re in town! Please book your tour in advance so you don’t get left out. Call 817-514-9567 or visit our Book a Tour page and fill out our tour booking form.